Xi Jinping, general secretary of the Central Committee of the Communist Party of China (CPC) and Chinese president, met Kim Jong Un, chairman of the Workers’ Party of Korea (WPK) and chairman of the State Affairs Commission of the Democratic People’s Republic of Korea (DPRK), in Dalian, northeast China’s Liaoning Province, on May 7-8. Dalian sees lush mountains, blue seas and drifting clouds in May. Xi held talks with Kim and hosted a welcome banquet for him. Together, they also took a stroll and attended a luncheon. In a cordial and friendly atmosphere, the top leaders of the two parties and the two countries had an all-round and in-depth exchange of views on China-DPRK relations and major issues of common concern. Comrade Chairman made a special trip to China to meet me again just after 40-odd days, Xi said, at a crucial time when the Korean Peninsula situation is undergoing profound and complex changes. This embodies the great importance that Comrade Chairman and the WPK Central Committee have attached to the relations between the two parties and the two countries, and to their strategic communication. “I speak highly of it,” Xi said. “After the first meeting between me and Comrade Chairman, both China-DPRK relations and the Korean Peninsula situation have made positive progress. I feel happy about it,” he said. 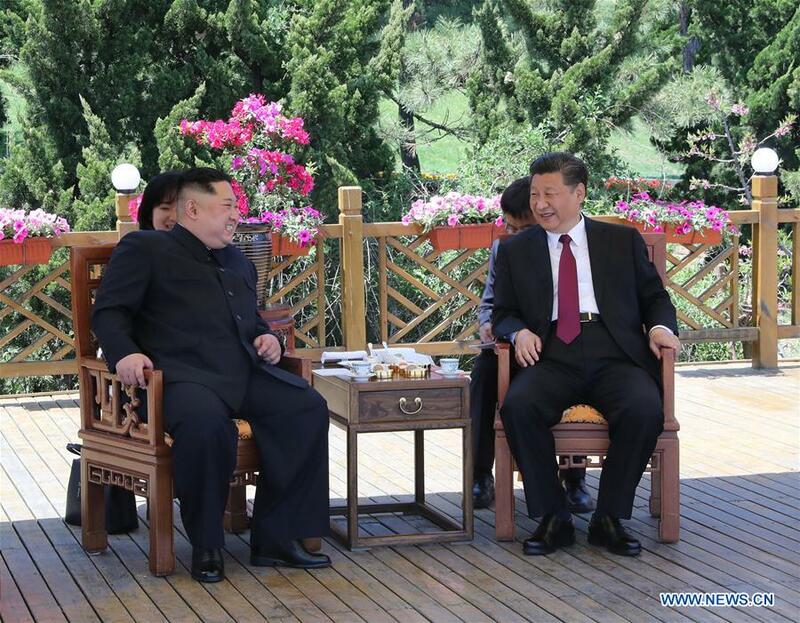 Xi said he was willing to meet Kim again to make joint efforts to push the healthy and stable development of China-DPRK relations, realize long-lasting peace and stability on the Korean Peninsula, and promote regional peace, stability and prosperity. For his part, Kim said both the DPRK-China friendship and the Korean Peninsula situation have undergone meaningful progress since March this year. “These are the positive outcomes of the historic meeting between me and Comrade General Secretary,” he said. At a crucial time when the regional situation is developing rapidly, Kim said he came to China again to meet with General Secretary and inform him of the situation, hoping to strengthen strategic communication and cooperation with China, deepen DPRK-China friendship, and promote regional peace and stability. Xi said that with concerted efforts of both sides, all of these consensuses are being well implemented. Within a period of more than one month, he and Kim met twice and they have been keeping in close contact, Xi said. He said that he is willing to work together with Kim to continue to guide relevant departments of the two sides to soundly implement the consensuses they have reached, promote the continuous advancement of China-DPRK relations, benefit the two countries and two peoples, and make positive contributions to the peace and stability of the region. Xi also extended sincere gratitude to Kim for his great attention and earnest attitude demonstrated after a major road accident in the DPRK which resulted in casualties of the two countries’ citizens. North Korea, Iran are secured under Southern Countries Union- SCU led by Russia, Turkey representing Europe, China, India, Japan, Indonesia representing Asia, Brazil, Mexico representing South America, Egypt, South Africa representing Africa, with Southern Union Bank- SUB, Southern Monetary Fund- SMF, with its international instruments for finance, trade etc. America has fallen forever, 20th century world international order is dead and gone forever with its dead fraudulent UN etc. The birth of 21st century world international order has come with Southern Countries Union- SCU. This is 21st century world. God Is With Us!! !